Honestly I didn’t know it was Asteroid Day till I checked in with NASA this morning. Their Twitter feed said it’s Asteroid Day, and who isn’t going to believe NASA. Other than Flat Earthers, Moon Landing Deniers, and the White House. 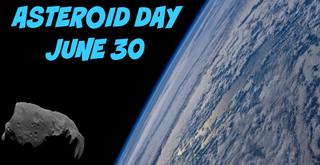 If you are wonder how to celebrate Asteroid Day, they have a free 24 hour feed here, https://asteroidday.org/live/ (Also on NASA TV). As of writing this it has Brian Cox with a panel talking about how the international community should handle regulating near earth objects. Also the AsteroidWatch Twitter feed is following todays events too https://twitter.com/AsteroidWatch.